May 8, 2017, 4:19 p.m.
By Joseph Lichterman @ylichterman May 8, 2017, 4:19 p.m.
Last month, British prime minister Theresa May called a surprise snap election. Parliament was quickly dissolved and MPs headed back to their constituencies across the country to campaign ahead of the June 8 vote. At the BBC, the election also brought about a change of plans. 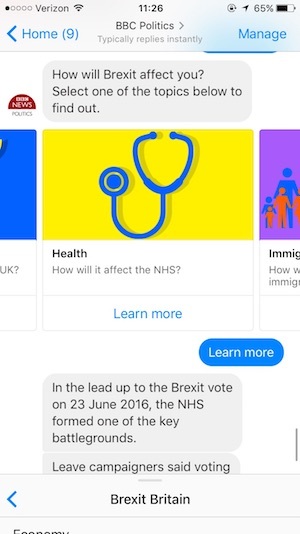 In March, the broadcaster had launched a Facebook Messenger bot solely focused on Brexit and the process surrounding the U.K.’s withdrawal from the European Union. But with an election looming, the BBC decided to turn its Brexit bot into an election bot covering the campaign. “We all felt it would have been remiss of us to have taken the concept of what we were doing with Brexit and just to shelve it for six or seven weeks while the election campaign was going on,” said BBC News social media editor Mark Frankel. The BBC launched the temporary rebranding of the bot on Saturday, and it plans to have the bot focus on election coverage through next month’s vote. The bot is affiliated with the BBC Politics Facebook page. The broadcaster worked with The Bot Platform, a London-based Messenger bot developer, to create the bot. Like many legacy outlets, the BBC sees Facebook, and Messenger in particular, as a way to reach a younger, more female, and more diverse audience. Last year, the BBC decided to launch a number of single topic Facebook pages covering areas such as entertainment, family and education, and lifestyle and health news. It sees the Messenger bot as an extension of that strategy, Frankel said. The BBC felt it had the latitude to transition the bot to focus on the election because the audience that found the bot through the BBC Politics page is likely interested in this type of coverage and also because Brexit is also at the heart of the election. That daily business includes breaking news alerts, analysis and opinion, explainers, a quiz, and other story formats. 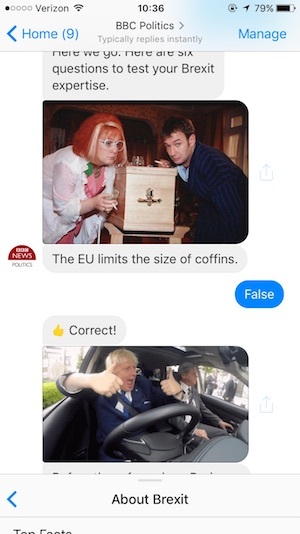 The quiz, for instance, offers users true or false questions about the European Union, such as whether the EU regulates the size of coffins (false) and whether the EU forbids kids under the age of 8 from blowing up balloons (also false). Users can get more details about each of the topics discussed, and each answer includes a GIF of British politicians, like the eminently GIFable Boris Johnson. The explainers, meanwhile, are written in a choose-your-own-adventure format with preselected questions that let users dig deeper into how Brexit will impact the economy, education, health, and immigration. Frankel said it was a challenge to find the appropriate tone for stories on the bot. “You want it to encourage people to see it as a friend helping you navigate your way through a complex subject rather than something that is just telling you lots of information,” he said. Frankel said that the BBC plans to adapt some of these features for the election coverage. It plans to add in information about the parties’ platforms once they’re released. Also, in previous general elections, the BBC has had a feature where users on its website can get localized information based on their postcode and it hopes to add that type of functionality to the bot. Though it’s still fairly early days for Messenger bots, Grant Heinrich, The Bot Platform’s head of audiences, said he expects news organizations to continue to use them to try and reach new readers — especially as people spend increasing amount of times in messaging apps. News organizations also, he said, might be willing to try out short-term, story-focused bots like the BBC’s election project because Facebook Messenger gives outlets a relatively flexible platform to work with. 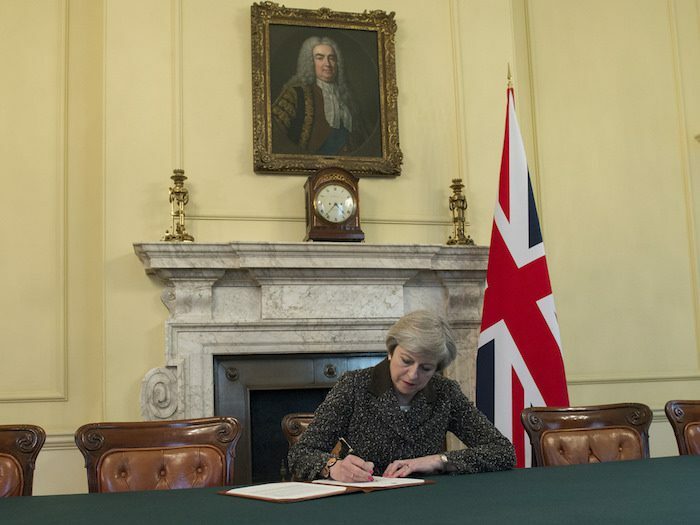 Photo of Prime Minister Theresa May signing her letter of notification to the President of the European Council setting out the United Kingdom’s intention to withdraw from the European Union by Jay Allen/Number 10 used under a Creative Commons License. POSTED May 8, 2017, 4:19 p.m.
Lichterman, Joseph. "After a snap election was called in the U.K., the BBC turned its Brexit bot into an election bot." Nieman Journalism Lab. Nieman Foundation for Journalism at Harvard, 8 May. 2017. Web. 24 Apr. 2019. Lichterman, Joseph. "After a snap election was called in the U.K., the BBC turned its Brexit bot into an election bot." Nieman Journalism Lab. Last modified May 8, 2017. 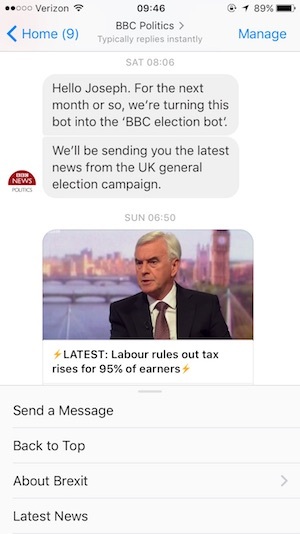 Accessed April 24, 2019. https://www.niemanlab.org/2017/05/after-a-snap-election-was-called-in-the-u-k-the-bbc-turned-its-brexit-bot-into-an-election-bot/.